Husband, father, golf course superintendent, clumsy woodworker, weather nerd, amateur curler. 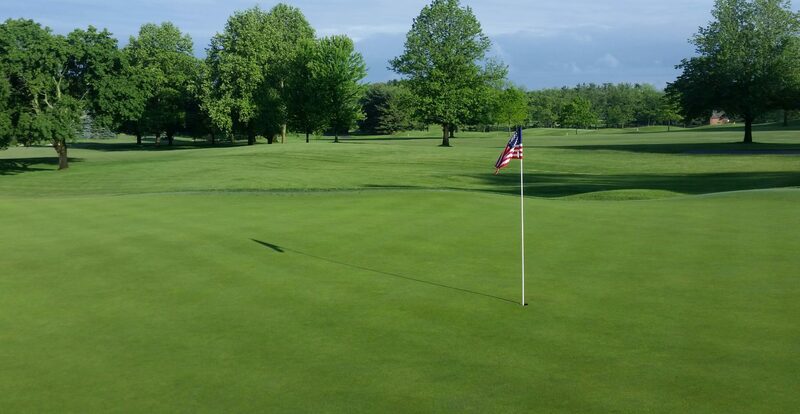 We are happy to announce that the golf course will open this Saturday at 12 p.m.! Based on the latest forecast, there will be ample frost both weekend mornings, hence the noon start for tee times. The Practice Facility will open April 2, as there is still some frost in the ground in this area. This will give the turf some additional time to begin growing and recover from daily use. Course conditions will be evaluated on a day by day basis for its availability for play due to weather. It is highly recommended that you call the golf shop for the latest updates on course conditions and availability. Soil temperatures are above freezing! This week, we began prepping low cut surfaces for play. The frost is out of the ground (except in areas at the Practice Facility), and turf has wintered well with no large signs of disease or stress. As is normally the case this time of year, playing surfaces will be mowed or rolled as the weather and growth dictates. Other practices, such as raking bunkers, will be done on an as needed basis. Our seasonal employees will begin to return next week as well, but this return is based on historical dates that have been determined by weather as well as budgetary guidelines set for the year. As it has been the case over the years, we anticipate being fully staffed by Memorial Day. Many of you over the years have asked why the putting surfaces look so mottled and some of the grass looks purple this time of year. The main reason is how the plant reacts to the transition to winter. When frosty or below freezing nights become a regular occurrence, the chlorophyll in the plant (green pigment) can denature in some bio-types of Poa annua, the main species of turf on Elcona’s greens. This denaturing leads to other pigments that may normally be hidden by the chlorophyll to be revealed, such as a red/purple pigment called anthocyanin. Anthocyanin is also the same pigment that gives Elcona’s trees such vibrant reds, oranges, and purples in the fall. When regular growing conditions arrive to our area, the plant will produce more chlorophyll and turn green again. The staff has done a wonderful job with course clean up over the last 2 weeks. While this winter did not bring as much snow to our area as it normally would, we experienced several days where the winds were over 30 MPH sustained. As you can imagine, there was a higher amount of tree and leaf litter on the course than in a normal winter. We will finish this work up over the next week or so. We also have filled in all stump holes with top soil, and will sod or seed them when better growing conditions arrive to our area. A few of you have asked about the removal of a large oak tree between holes 1 and 18, just past 1 tee. This tree began dropping leaves quite rapidly in August, which is not normal for any oak tree to do. This tree first succumbed to Oak Wilt, the same disease that affected the oak we removed in 2016 near 1 green, and I made the recommendation to remove the tree to prevent the disease from spreading to other oak trees in the area. When it was removed, we identified these large caterpillars, which are larvae of a wood boring beetle. These are an indicator of a diseased tree, and if left alone, could create a safety hazard. If you have any questions, please do not hesitate to contact me at ryan@elconacc.com. I look forward to seeing you out on the golf course! The golf season will be here soon! The winter of 2018/19 has been full of ups and downs weather wise. The old addage, “If you don’t like Indiana weather, just wait a day.” has been quite true the last 3 months. The golf course is holding its own so far as we head into winter’s homestretch (we hope). Ice accumulation has been a focus of ours with the ice storms we have encountered in the last 3 weeks, however there is no cause for concern for the turf. It is however something we will continue to monitor. When the ice melts, we have been out with our squeegees moving as much water as we can to help prevent refreezing and crown hydration injury to the Poa that dominates the putting surfaces. The staff and I are almost complete with our annual tree maintenance and removal program. This last week, we have been focusing on the area at the intersection of US 20 and CR 21. This area has several Silver Maples that had begun to decline, as well as a Sugar Maple that had severe storm damage from last May’s MNO storm. Once the stumps are ground and holes are filled, this area will be much improved and a cleaner look as everyone enters to use the club. US 20/CR 21 intersection after tree removal. The ice storms have kept us busy with tree clean up however, as these weather events reek havoc on softer wooded trees, like the white pines shown below. Winter also means improving our facility and making it more efficient. Lighting is in the process of being upgraded to LED technology, increasing the level of brightness and safety to the space while reducing the amount of energy needed to light the area. The employee locker and break areas have also received a nice face lift and improved efficiencies. The staff has done a fantastic job with this work! The finished break area, with LED lighting. For our staff, winter also means attending educational seminars and shows to further hone our skills and get the latest updates on trends happening in our industry. This year’s dominate theme is again common in most everyone’s industries today: Labor efficiency and attracting and building a great team. We also have sat in on talks centering on the increased use of data analytics to monitor growing conditions, and I got to view some of the robotic machine technology coming out within the next few years. The new Rules of Golf have been discussed quite frequently as well. All in all, there are many reasons to be excited about the future of golf, both from a game and course maintenance perspective. If you have any questions, please contact me at ryan@elconacc.com. Have a great week and stay warm! While still bringing colder temperatures, this is the first December I can remember that will receive less snow than November brought. When we are kept indoors, the staff have been hard at work refurbishing course markers. Our equipment manager, Steve Ott, has begun his annual thorough review of machinery, readying it for the 2019 season. Pictured below is his December project, rebuilding the clutch on our Ford tractor used to blow fairway debris during the growing season. Rebuilding this tractor’s clutch involves splitting the engine from the transmission (safely!) and securing both units with chain hoists. Leaves are wind rowed for easier mulching and removal. Sweeping leaves from a thick area between 4 and 5. The idea here is to promote a healthier stand of turf. Our staff has used nicer weather to complete annual tree work and maintenance, and even catch up on leaf clean up. One piece of equipment we have added to the mix is a leaf vacuum. We have used this unit in the past removing aerification plugs and debris from fairways, but we have learned it can be a good tool to help clean areas where leaves are quite thick and could possibly smother the turf. What is going on below the grass surface on a warmer winter day. Graphic courtesy of Dan Blanchard, assistant super at The Bay Club. With the warmer temperatures we have had sporadically, some of you have asked if the course is open. Course conditions are monitored daily for availability, and while it is nice to get a warm day or three in a row, once ground is frozen, it takes many days for it to thaw adequately for safe traffic and play. To the right is a graphic detailing why. When the warmth heats initially, the ground thaws from the top down. If traffic is allowed while the rootzone is still partially frozen, roots can shear off and harm the plant before growing weather returns and the plant can heal itself. 7 landing area on a 44 degree afternoon in December. Not much sunshine! While most turf areas get adequate sunshine, some areas do not this time of year due to the much lower angle of the sun. It was not uncommon to see frost in the afternoon on both 2, 5, and 14 greens last week, as well as the area on 7 pictured to the right. Please continue to check in with the golf shop for the latest course availability. A piece of wood from the bee hotel. Notice the tiny holes in the mud, evidence an egg hatched and a new bee emerged ready to live its life. Lastly, a topic of conversation through the year was the bee hotel project that we installed left of 16. I wanted to share my initial observations. Out of the 230 holes available for habitat usage, 120 had signs of insect reproduction (holes filled and closed with resin or mud) and another 78 had what I would consider a complete usage (holes filled, with a sign that an egg hatched and burrowed out into the real world). This was a fun experiment to compliment the club’s Audubon program, and next year we plan on installing a couple more near the rain garden and north of number 13. I am very appreciative of the support given to me by the club to experiment and communicate to the community the great benefits that a golf course can provide to our local ecosystem. If you have any questions, please email me at ryan@elconacc.com. Thank you for reading, and I hope you have a happy and safe holiday season! Good morning from a snow covered Elcona. Just as we had very little time to transition from winter to summer, it seems like we received little time to transition back to winter. November was much below normal temperature wise, and quite snowy. Unlike last year, November has unfortunately presented next to no opportunity for you to enjoy your golf course. A good sign though is the return of a healthy herd of deer and turkeys that utilize the property as habitat. Many of you have asked where they disappeared this year, and I can attest that they are around and have been frequently observing our staff’s work on the course. As with all of 2018, this early beginning to winter has presented new challenges to course winterization efforts, but these are almost completed as of this writing and have gone fairly smoothly. Final mowings, blow out of the irrigation system, applications of plant protectants, and a heavy blanket of topdressing sand have been applied to best protect the fine cut turf from the conditions that these next 4 months bring to Northern Indiana. I have written about the benefits of each of these here, and below are some pictures of this year’s efforts. In our industry, we liken this final heavy sand application to putting a blanket on the greens and “tucking them in for the winter”. Bob Vavrek of the USGA wrote a great article further explaining this application that you can access here. I want to thank my staff for their tireless efforts preparing the course so that we could fit these activities in between weather events. The renovation of 17 tee has also been a focus of our time in the last few weeks, and as you can see from the pictures, turned out great. The blue and black tees are now one tee complex, and the tee is now 6 feet wider than the old tee. In the spring, we will finish the grade work around the rough in this complex to complete the project. We now are beginning a transition of duties during the winter season. Evaluations of our agronomic plans and staff plans are on going to better our operation for 2019. Equipment maintenance, such as deep cleaning and blade sharpening is in full tow. We have also began our winter tree work on the course. The focus this month was on the storm damaged trees from last May. Other areas of tree work focus involved the border with US 20 and CR 21, and transforming the aesthetics along the native area on 15. We also have planted a few trees strategically on the golf course per the Master Tree Program and recommendations from the Golf/Greens Committee. This work will continue throughout the winter, weather permitting. Machinery cleaning is essential for a good start to the next season. We also have added a new tool, called the Root Hog, to our winter work. Best described as a hand held stump grinder, this tool has been implemented to shave down roots in various areas that will smooth transitions for our mowers and golf cart traffic. We will continue to utilize this tool throughout the year to improve areas on the golf course. Finally, Greg Stump and his wife Sharon have worked their magic yet again transforming the clubhouse into an awesome spectacle of Christmas spirit. I cannot thank them enough for their efforts and hope you continue to enjoy the many hours of decorating that they put into the 2018 Holiday Season. If you have any questions, please contact me at ryan@elconacc.com. I will have a final blog article in December that will take a look back at 2018. I hope that each of you have a safe and enjoyable December. Late October is always one of my favorite times of the year. The color contrast on the golf course created from horticulturist Greg Stump’s hard work and beautiful design palette starts being replaced by Mother Nature’s vibrant display on the oaks, maples, and even tulips this year. As the sun starts to set on the 2018 golf season, the grounds staff and I have been busy finishing up fall agronomic practices, starting fall leaf clean up, and beginning late fall activities. Many of you have asked me about areas that had thinned out in the intermediate and primary rough, like the area on 4 pictured to the left. These areas have suffered in the last 8 weeks from a combination of a fungal disease (called Gray Leaf Spot) and traffic wear from machinery and cart traffic. The early arrival of summer left many of these plants shallow rooted and over the course of the season, weakened to the point where wear and disease took their toll. We have seeded many of these areas with better varieties of grass, and have seen good recovery in many areas. With the end of the growing season here, any areas that are still thin will be seeded next spring. These areas will also be roped off to allow the seed to properly germinate and fill in before the heart of the 2019 season arrives. Tom Thome overseeding the Practice Tee. The practice tee has also been a topic of discussion. With the major increase in use it has experienced in the last few years, a major challenge for us is to allow enough time for new grass to germinate and fill in before it is opened back up to use. This year, Tom and I started dividing the tee into 3 segments, to better distribute the wear and maximize the time the other sections have to heal. The divots taken on the tee are filled weekly by our staff. After a section is taken out of service, we heavily overseed the area. The tee also receives a monthly application of fertilizer. We will continue to experiment with different methods and seed varieties to better fill in the used sections and further provide you a quality tee to hone your skills on year round. Marking the new areas of 17 tee. Well, one of us is. The sod is cut for easier removal or transplanting. The blue and black tee on #17 is also being renovated. The rough in between the two tees have been heavily contaminated with Poa over the years, and its width has dramatically shrunk as well. The two will be combined into one tee with a gentle slope separating the areas, and widened back to its original size. The project is expected to completed by next week. A boat is needed to properly thin the cattails in 14 pond. While the golf activity on the course has dwindled down, many jobs need to be accomplished before the real cold air shuffles its way here. The native areas are mown down for the year, cat tails are thinned in the ponds, herbicides are applied to take care of any weeds on the course, and ballwashers and other water features are pulled in for the year. Two major jobs ahead for us include winterizing the irrigation system, which will take place November 5-7. If you are out on the course these days, please heed caution as sprinklers are automatically turned on and off during this process. The greens will have their annual deep tine aerification performed on November 5th as well. These 1/2″ holes, penetrating the soil profile about 8″, create three advantages: additional channels for spring root growth, aid in relieving any deeper compaction within the rootzone soil profile, and extra drainage capabilities for ice/snow melt to prevent ice formation on the plant surfaces. The greens are rolled immediately after being aerified, and these holes do remain open throughout the winter for the above mentioned reasons. Raising mower heights. The height of cut on greens from the normal height of .120″ to .135″ slowly. Raising height of cut allows more leaf surface for the turf to maximize their photosynthetic capabilities and carbohydrate storage. Raising height will also lessen stress to the plant and create a deeper root system going into winter. While raising heights may not create the speeds that summer brings, it is best for the long term health of the greens going into winter. Fertility and Plant Protectants. While we limit nutrients on finely maintained turf during the season to provide great playing conditions, the fall is the best time to feed the turf to maximize carbohydrate storage going into winter. The more carbs the plant stores, the quicker it will break dormancy when temperatures warm up in the spring. Winter can also bring the threat of snow mold to all varieties of turf on the golf course, and our sprayers will be out applying plant protectants to help prevent infection from those fungal diseases. Topdressing. When growth has ceased for the year, we will apply a thick coating of sand topdressing to bury the crowns and as much leaf tissue as possible. This sand helps protect and insulate the crown of the plant from any extreme cold temperatures. This practice is very effective in protecting the turf from any potential ice damage and helps maintain a smooth surface when the course opens next year. If you have made it to the end of this longer than normal blog post, thank you for reading. As you can gather, fall is the busiest time of year for our staff. If you have any questions, please reach out to me at ryan@elconacc.com. Have a great week, and I still hope to see you out on the golf course! We successfully aerified the front 9 greens yesterday with what turned out to be a gorgeous day weather wise. Below are some pictures of the process we are using this year. The first step is applying a generous layer of sand. As you can tell, we got a very early start since this step takes a while! Here is a video link to the actual aerification. We have 2 tractor mounted aerifiers that put 1/2″ holes in the soil profile, spaced 1″ x 2″. After the sand is dry, we take a tow brush and broom the sand to get most of it into the holes, as well as more evenly distribute it. After that, we take a blower and blow the remaining sand into the holes. We have incorporated a blower more into this process due to it being a less-abrasive alternative to dragging sand in. The final result on #7. Unfortunately, inclement weather has postponed our efforts to get the back 9 aerified. The topdressing and brushing process needs complete dryness for a successful result, and the current radar is not giving us the 7 hour window necessary to complete the above process. We will perform this necessary practice on Monday, October 8th, which is a closed day for the golf course. Fairway aerification will start the following day, with all 18 holes open during that process. If the weather cooperates for us, during the weekend the front 9 greens will be rolled daily. The back 9 greens will be mowed and rolled as they would be normally. Any additional sand that is necessary will be applied when weather allows. I appreciate your understanding and patience while we work with Mother Nature to complete this part of our agronomic calendar. If you have any questions, please email me at ryan@elconacc.com. Have a great weekend! We have had some incredible weather in the last month for the beginning of fall golf season, and hopefully everyone has had a chance to take advantage. Leaves are beginning to change color, and even begin to fall in areas. It is truly hard to believe that both Ladies Closing Day and the Men’s Hole in One Stag are this week, signifying the end of the main golf calendar. Even with that approaching, there will still be ample opportunities for some great fall weather to come out and enjoy your golf course. Mowing fairways on a foggy morning. Our staff was quite busy in the last couple of weeks beginning our fall agronomic practices. Greens and fairways were verticut, a process that removes some excess growth and organic matter. A video of our fairway verticut mower in action on #6 can be viewed here. The end result of tee aerification. Lots of thatch removed! Tees were aerified on September 4th, and as you can see to the left, we removed a lot of thatch from them! With the warmer temperatures we had, the holes have already healed in for the most part. Here is a link to a video of all staff performing their role in clean up. The process involves many persons on blowers, as well as drag mats and manual removal of the excess grass in the end. They all did a wonderful job! Greens will be aerified on October 4th (Front 9 and the Large practice green) and 5th (Back 9 and Small practice green) using a solid 1/2” tine. Both before and after poking these holes, a generous amount of sand will be applied to incorporate into the surface. We will then use brooms and blowers to get that sand into the holes, and finish off with a roll. Final product at the short game area with a happy staff member. Fairways will be aerified the week of October 8th, using a solid 5/8″ tine. Both processes will involve no plugs being brought up, which is how we aerify them in the spring. All of this is of course, weather permitting. With the multiple chances of rain in the 10 day forecast, it is best to call ahead to the pro shop for the latest information on the golf course. I will also send out updates via this blog. Below are a couple pictures of us fine tuning the process on the short game greens last week. Bowser and I were pretty happy with the result given the drizzle that fell when we were trying to brush and blow the sand in. While a short term inconvenience to ball roll and playability, aerification is the foundation of proper soil and turf health and a critical component of any agronomic program. It provides new channels for root growth, oxygen to the rootzone, additional avenues for drainage, and relieves compaction. The USGA has a few nice articles further explaining the benefits and importance of aerification, a couple of which you can view here and here. Thank you for your patience and understanding during this busy and quite necessary time in our maintenance schedule! If you have any questions about aerification, or the golf course, please email me at ryan@elconacc.com. Please enjoy the great weather that October usually brings to our area. I hope to see you out on the golf course!